Employers often rely on recommendations from their plan advisors to determine what features and investment options they should include in their defined contribution retirement plans. Deciding whether they should allow participants to generate retirement income within the plan (and, if so, what strategies they will offer) is among the important considerations that sponsors bring to their advisors. As more advanced decumulation strategies have begun to generate headlines, the value of an advisor’s input in this area has grown significantly. Most plans currently allow for strategic post-employment withdrawals through systematic withdrawal options or plans, or through required minimum distributions. However, in the last decade or so, new options for building and managing retirement income inside of a DC plan have been competing for the attention of retirement plan advisors. These new strategies cover a wide range of attributes. Most revolve around creating guaranteed lifetime income, including the in-plan guarantee, the in-plan guarantee in the form of a deferred income annuity, and a target-date fund that converts to an annuity. But others are of a non-guaranteed variety, such as a managed payout fund. Another prominent option, managed accounts with a draw-down feature, can offer either guaranteed or non-guaranteed income, depending on the specifics of the retirement plan. 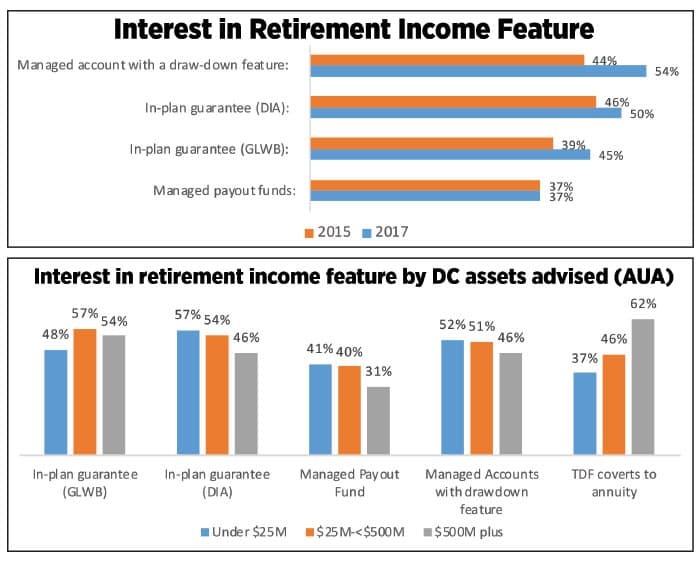 Recent LIMRA Secure Retirement Institute research finds a majority of consultants and advisors for DC plans indicate they are interested in these new approaches to generating retirement income. More than half (54 percent) of advisors said they were most interested in offering a managed account with a draw-down feature. In second place was the in-plan DIA option (50 percent) and the in-plan GLWB came in third at 45 percent. Interest in managed-payout funds was the lowest, with only 37 percent of advisors showing any interest. LIMRA SRI survey conducted in 2015, managed accounts with a draw-down feature and in-plan GLWBs showed the largest increase since that time. Although it’s not universally true, interest in retirement income options tends to be higher in the smaller advisory practices. The biggest difference can be seen in the in-plan guarantee option, where 57 percent of advisors with small practices show interest, compared with 46 percent with large practices. A target-date fund that converts to an annuity is the only option for which advisors in larger practices show a higher level of interest. As advisors with smaller DC practices may be more participant focused than their larger counterparts, it seems logical they would place a higher value on these features. Although few advisors (9 percent) currently recommend these in-plan guaranteed income products, the continued and growing interest is encouraging for manufacturers. With new legislation such as the Family Savings Act being introduced in Congress, there is hope that advisors will be more comfortable making a recommendation. Current proposed legislation intends to clarify laws around selecting an annuity provider and includes lifetime income portability protections. Mark Paracer, senior analyst for LIMRA's Retirement Research, is the project director of several benchmarking studies on variable and indexed annuity guaranteed living benefit election rates, as well as a new survey on in-plan guarantees. He is also responsible for conducting research on retirement income. Contact Mark at [email protected] .